Find out more about our commitment to protect people we work with from sexual abuse and exploitation on our Safeguarding page. We aim to deliver lasting change for the people and communities we work with. To achieve this, we need to be open about what we do, so our donors and supporters can trust us to spend their money wisely, and the people, communities and partners we work with can help make our shared work as effective as possible. Over our 70-year history, we’ve built our reputation on trust and results. We are always willing to learn from things that didn’t go so well, in order to improve our performance and increase our impact in the future. We publish a range of information on this website including annual reports, vision and mission, strategic plan, and information and stories about our work. If you can’t find what you are looking for on this website, please contact us. We also publish information about CARE programmes and projects funded or part-funded by the UK government under the International Aid Transparency Initiative. IATI is a global transparency standard that aims to make information about UK aid spending easier to access, use and understand. 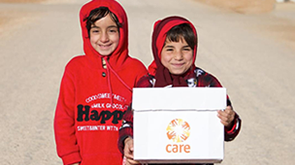 CARE International is a global organisation with 14 full members (of which the UK is one) delivering humanitarian and development projects in more than 70 developing countries. At any one time, CARE supports around 900 poverty-fighting projects in poor and vulnerable communities around the world. We publish a range of stories about our work on this website, but we are unable to provide and maintain up-to-date information on all of CARE’s hundreds of projects and programmes. If you require information about a specific project or programme that is not featured on this website, please contact us. External evaluations of our work are published on CARE’s dedicated evaluations website. CARE International UK is a registered charity (number 292506) and a company limited by guarantee (number 01911651, England and Wales, established 7 May 1985). We are bound by our Memorandum of Articles. Information about our role in the global CARE International federation is included on the About CARE page of this website. We are governed by a Board of Trustees who are Directors for the purposes of company law and Trustees for the purposes of charity law. The executive management of our work is led by our Senior Management Team. Information on our income (including details of donors and funders) and our expenditure is published on this website. Our full financial statements are included in our Annual Report and Accounts. We work in partnership with local NGOs, community-based organisations and community groups in both our humanitarian and long-term development work. We provide information on the IATI website about partner organisations that we work with on programmes and projects funded or part-funded by the UK government. At any one time, CARE supports around 900 humanitarian and development projects, of which half are fully or mostly implemented with/through partners, and a further 18% have some project activities implemented with/through partners (figures for financial year 2015). We are unable to provide and maintain up-to-date information on all of these partner organisations, but if you require information about the partners that we work with on a specific project or programme, please contact us. We work with government ministries to implement projects and influence policies in favour of poor communities. We work with a range of international, national and local organisations and groups on advocacy initiatives. We work in partnership with private sector companies when we believe that the partnership will lead to positive outcomes for poor and marginalised people and is in line with our values. CARE is committed to accountable, just and sustainable development that benefits the most vulnerable and excluded communities around the world, especially women and girls. Our organisation-wide Accountability Framework guides the way we capture, report and receive feedback as well as share, learn, and make improvements to our work around the world. CARE International UK’s inclusive governance team is responsible for supporting CARE’s country offices to enable the communities we work with to hold us accountable. Known as ‘forward accountability’ or social accountability, this approach aims to put our primary stakeholders – the people and communities whom we seek to assist – at the very heart of our work. The aim is to enable project participants (or intended ‘beneficiaries’) to genuinely understand and influence the programmes from which they ought to benefit, and in this way hold CARE accountable. We work to ensure the active involvement of participants (people and communities), and provide opportunities for feedback and dialogue between CARE and our participants, at all stages of our programme and project cycles (planning, implementation and evaluation). In responding to emergencies we are committed to the best practice and continuous improvement. Our commitment to accountability at all stages of emergency preparedness and response is set out in the CARE International Humanitarian Accountability Framework. CARE is a signatory to internationally accepted humanitarian standards and codes of conduct, in particular the Red Cross and Red Crescent disaster relief code of conduct and the Core Humanitarian Standard on Quality and Accountability. We are a member of the Core Humanitarian Standards (CHS) Alliance, where we provide leadership on establishing accountability mechanisms for crisis-affected people in general and women and girls in particular. We are on the board of The Sphere Project which brings together a wide range of humanitarian agencies to promote effective and accountable humanitarian assistance, and we are signatories to the Charter4Change which commits us to support practical changes to the way the humanitarian system operates to enable a more locally-led response. We conduct an annual accountability review as part of our membership of the Disasters Emergency Committee (DEC). We have supported changes to policies and procedures, and incorporated the risks relating to modern slavery into training and capacity building. CARE is continuing to campaign for a new ILO convention to end violence and harassment in the world of work. We believe that such a convention could also help address issues of modern slavery further down supply chains. More details are available in our Statement on Modern Slavery. Policy statements, briefings, reports and other publications are available on our policy and research website CARE Insights. Several of our organisational policies, procedures and guidelines are available to download from this website. If you think we have done anything wrong, or if you have a complaint or any other observation about the way we do things, then please contact us to tell us about it. We aim to deal promptly with complaints and provide a clear response. Confidentiality will be maintained at all times. We will treat all feedback as an opportunity to improve and where we have made mistakes we will apologise and try to prevent them from reoccurring. Please also see the information below about our anonymous ethics line for reporting wrongful conduct. We aim to be an organisation that acts with integrity and honesty. Our whistle-blowing policy encourages and enables workers to raise concerns about misconduct within CARE International UK. Our Code of Conduct sets out the standards of conduct expected of everyone who represents CARE International UK – including employees, trustees, volunteers, consultants, secondees, and interns. In addition to our feedback and complaints and whistle-blowing policies, CARE also provides an anonymous ethics line which staff and anyone outside the organisation, anywhere in the world, can use.